Martha Cooper is a second generation dance caller currently living in Peterborough ON. She first started calling with her father Eldon Cooper, and upon moving to Ottawa she fell in with the likes of Catherine Burns and Pippa Hall. Now more than ten years later, Martha has called dances in Ottawa, Toronto, Kingston, Montreal, Vancouver, Seattle, Syracuse and more. She calls community dances, workshops in schools, weddings and parties. Martha has worked with all level of dancer from beginner to experienced. If Martha is not calling a dance, or dancing, she greatly enjoys playing for the dances. 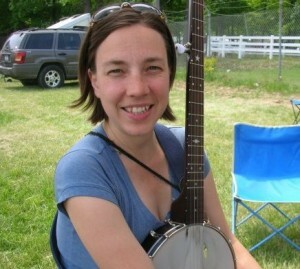 As a 5-string banjo player, an Irish flute and bodhran player, Martha is at home in all rolls at a contra/square dance! Martha is also a music and movement teacher for very young children. A trained Kindermusik and Suzuki Early Childhood teacher, Martha has designed a program to help children learn about how their bodies can move and be expressive while at the same time learning the fundamentals of music. From as young as newborn babies to children of 5 or 6, Martha’s music program pleases all.